We’re Preparing Students for What Year? I recently watched a video from the TEDxNYED that really hit home. A Challenge from Heidi Hayes Jacobs is a short (around 15 minutes) presentation not about educational reform, but educational “upgrades”. 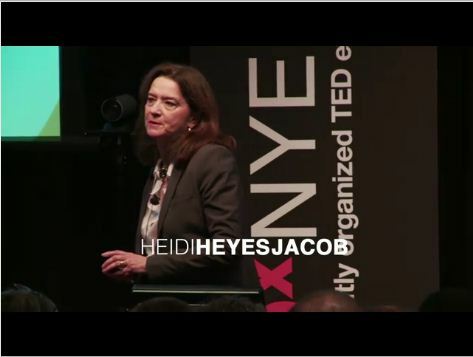 Heidi Hayes Jacobs believes our educational system is not preparing kids for today but for years past. She believes we should be paying attention to things like global, digital, and media literacy (as well as others). She points out that we are using dated content, skills, and assessments that are not relevant to today’s learner. She suggests that schools need to have students solving real life “stuff” and get evaluated on how well they accomplish that. She makes a case for students having a part in developing rubrics and determining what makes quality products such as digital portfolios and more. She has lots of ideas for projects that students could be invovled in. An example, “Every student should design an app and solve a real problem for people….” and then be evaluated on that real life task. She has endless ideas for how we might make school relevant and engaging to students today. She doesn’t believe in school reform but new forms for schools where we look at making changes in how we schedule students lives and learning, how we group learners, where we meet, including the space around learners and she believes that it can start with each teacher making one change for the better. To me, I hear a lot of what she is saying (and writing) and see some very strong connections to what we focus on in eMINTS. I am following her blog in the Curriculum 21 Ning now and am going to pay attention to what she is doing and pass that on. And I will continue to believe that I can make a change one day, one training session, one class visit, one lesson, one student, one teacher at a time. Brooke Higgins is an instructional specialist with the eMINTS National Center. You can read more at her blog Higgins Helpful Hints Blog.